A bike rider died in a road accident that took place in Nishiganj Manabari area of ​​Mathabhanga-2 number block of Coochbehar district. The deceased has been identified as Mukul Barman. According to local sources, the youth was returning home from the market, when a pick-up van hit his bike on the way, causing him to die on the spot. Meanwhile the pick-up van lost its control and fell into a pit. 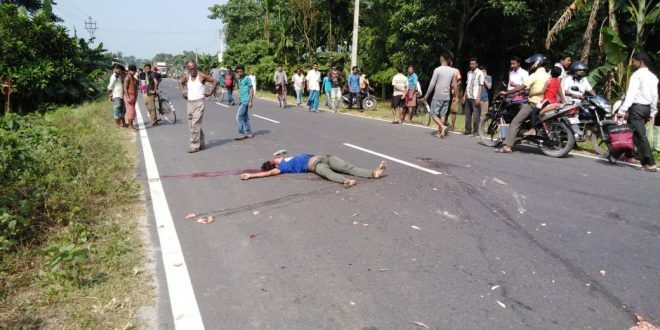 The police reached the spot from Nishiganj Out Post as soon as they received information about the incident and recovered the body and sent it to Mathabhanga Mahakama Hospital for post-mortem. The injured driver of the pickup van was also admitted to the hospital.